Ashlynn Waddell of Swanton with a kill from the left side last Tuesday at Evergreen. 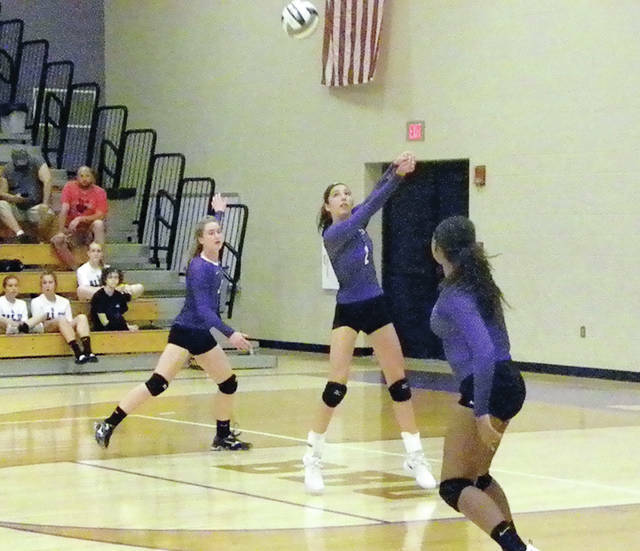 After sweeping Fayette the night before, the Bulldogs fell in four to the Vikings. Abby Arnold of Swanton (7) shoots one through an Evergreen block attempt last Tuesday. Alexis Sarvo of Swanton bumps one from the back row last Monday at Fayette. 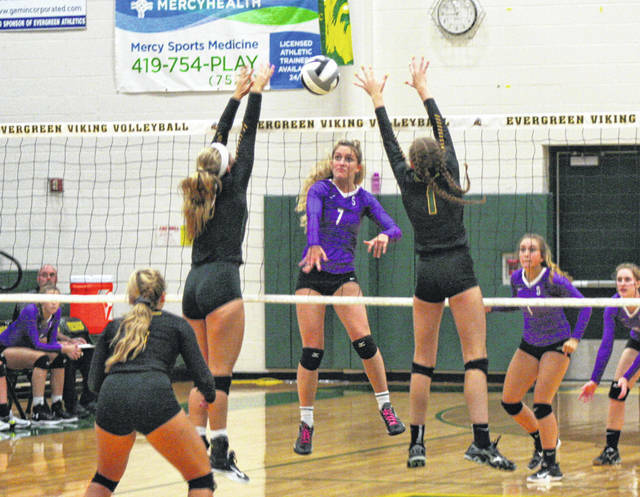 Evergreen let a big lead in the first set slip away, but didn’t allow it to happen again as the Vikings took down defending Northwest Ohio Athletic League volleyball champ Swanton 23-25, 25-11, 25-10 and 25-23 in the league opener Tuesday. 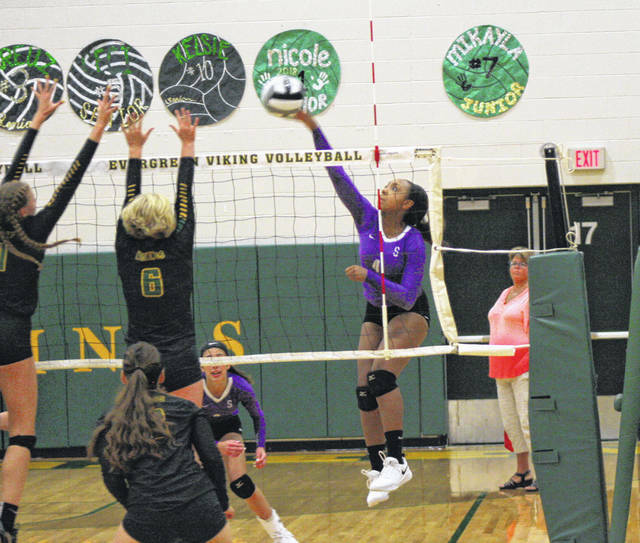 “Playing Swanton is always a big deal,” stated Viking coach Nichole Thanasiu. “It’s a rivalry game and they are always going to bring it tough..always. Swanton picked up a victory at Fayette the night before, winning 25-20, 25-19, 25-17. During Tuesday’s match, the Vikings raced out to an early 11-2 lead in the first set, mostly thanks to a pair of kills and three service aces from Kori Kreuz. However, the Bulldogs chipped away as the Vikes attacks began to go out, Jessica Dohm recorded an ace and a kill, and Abby Arnold’s push brought visiting Swanton to within 13-10. It was Arnold again scoring to bring the Bulldogs even closer, 15-13, before the teams alternated points to 19-17. Kelsie Komisarek’s shot off a blocker and a Swanton net violation gave Evergreen a 21-17 lead but Alexis Sarvo’s swing from the middle and another pair of Viking kill attempts went awry to get the Bulldogs within 21-20. Two Swanton attacks went out to give Evergreen a 23-20 lead. Arnold scored from the left to make it 23-21, then with the Dogs scooping up seemingly every Viking attack – including two sprawling digs from Sarvo – Evergreen went “out” on the next three points to give Swanton the win. Nicole Brand’s shot from the middle broke a 4-4 tie and lit the fuse on a 6-0 Viking run. Again it was Komisarek with two shots from the left side, McKenna Babcock with an ace, then Claire Conrad with a tip slam to bring the score to 10-4. Swanton came back with four straight on Ellie Beroske’s kill, Dohm’s ace and Sarvo out-strengthening a Viking at the net for the point to close the gap to 10-8. However, unlike the first set, the Vikings responded back with emphasis. Aces from Conrad and Cece Silvestri helped boost the Evergreen lead back to 17-9. Then it was Savannah VanOstrand with kills from the left and the right sides, Zoe VanOstrand with an ace and Babcock stuffing an overpass to finish the set. The third set was a near carbon copy of the second. Back-to-back aces from Babcock, along with two kills, including one that pinballed off three Bulldogs before hitting the floor, helped the Vikes get on top 9-3. A couple of aces from Conrad and three shots from Kreuz expanded the score to 20-8. Tips from Brand, Babcock and Kennedi Keifer’s ace closed out the third. The same scenario started the fourth set as again Babcock nailed consecutive aces along with a left side kill, and Savannah VanOstrand hammered one from the right to boost the Vikes up 8-3. Conrad’s ace made it 12-5 and then Babcock’s tip and a shot that left a vapor trail kept Evergreen up seven, 17-10. However, Swanton caught Evergreen in a favorable matchup and took advantage. Sarvo scored from the left, Ashlynn Waddell blistered a shot from the same place and Kylie Ulch scored an ace to get the Dogs back to 18-16. Savannah VanOstrand and Komisarek each scored off a block attempt to get the Vikes back up 21-16 but the Bulldogs scored seven of the next eight to take a 23-22 lead. Riley Gardner’s sideline shot, Arnold’s stuff at the net, and Sarvo’s ace combined with three straight Viking kill shots that went long gave Swanton the advantage. However after a timeout, Babcock ripped a shot from the left and again it was Savannah VanOstrand with a clutch shot that painted the back line to give Evergreen back the lead. A Swanton attack went long to finish the match. Last Monday against Fayette, Arnold paced the Dogs with 12 kills, five digs and four aces. Waddell added nine kills, while Sarvo finished with seven kills and eight digs. The Bulldogs traveled to Delta Thursday where they were defeated 25-18, 25-16, 21-25, 25-14. Swanton is at home tonight against Stryker.